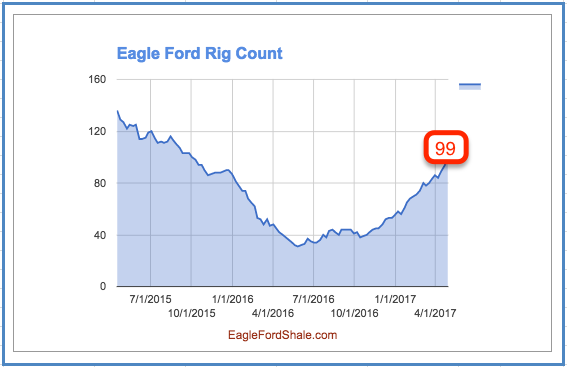 After weeks of steady increases, the Eagle Ford Shale rig count has stalled at 99 for three weeks in a row. In recent Eagle Ford News, Baytex Energy announced strong first quarter results for its Eagle Ford assets, including increased performance and a break-even point at $30 per barrel of WTI. A total of 885 oil and gas rigs were running across the United States this week, an increase of eight over last week. 172 rigs targeted natural gas (one less than the previous week) and 712 were targeting oil in the U.S. (nine more than the previous week). The remainder were drilling service wells (e.g. disposal wells, injection wells, etc.) 451 of the rigs active in the U.S. were running in Texas. Eight rigs in the Eagle Ford region targeted natural gas this week with the commodity trading increasing to $3.42/mmbtu. A total of 94 rigs are drilling horizontal wells, two are drilling directional wells and three are vertical. Karnes County leads this week with 23 rigs in production. See the full list below in the Eagle Ford Shale Drilling by County below. The Eagle Ford Shale drilling rig count has had its ups and downs, marking the rise of the region's shale development and the decline brought on by low crude prices.